STEVEN Caulker played 70 minutes for QPR's Under-23 side on Tuesday evening as the defender made his first appearance of pre-season since returning to training. The 25-year-old was featuring for Rangers Elite Development Squad in a 5-1 friendly win against Billericay Town. 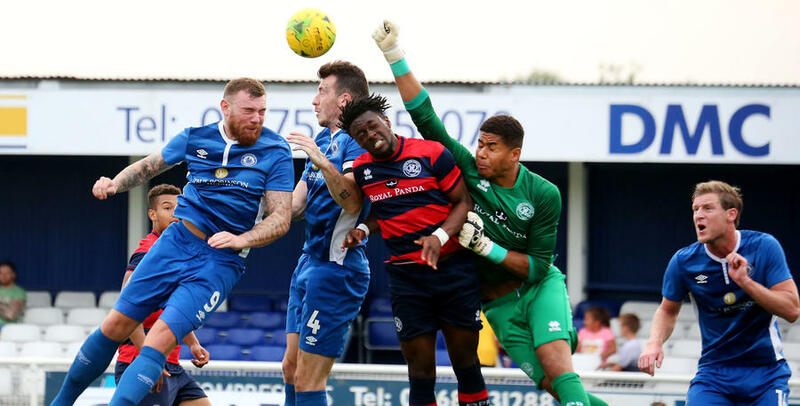 And it took QPR only nine minutes to take the lead against their Isthmian League Premier Division opponents when striker Axel Prohouly fired Paul Hall's side in front to make it 1-0 with an angled shot into the far corner. The hosts went close through Jake Robinson eight minutes later, as he tested R's keeper Seny Dieng, but his low shot was comfortably dealt with. Billericay continued to probe for a leveller and Louie Theophanous saw his effort cleared off the line by Rangers on the half an hour mark. However, four minutes before the half-time break Eberechi Eze doubled QPR's lead when he beat Town keeper Allan Julian with a smart finish after good work from Ilias Chair. Two quickly became three for the young R's side when Aramide Oteh buried his shot in the top right hand corner after beating his way past the Billericay rearguard with QPR finishing the first half 3-0 up. Following the restart Dan Walker shot over Dieng's bar as Billericay looked for a way back into the match before the hosts eventually pulled a goal back in the 54th minute. Second half substitute Billy Bricknall's shot on the turn helped Billericay reduce QPR's lead to 3-1. After Caulker made way 20 minutes from time, QPR played the final nine minutes with 10 men after goalscorer Axel Prohouly limped off leaving only substitute goalkeeper Martin Herdman on the bench. But despite the hosts numerical advantage QPR held on to secure a 5-1 win as they scored twice in stoppage time. Firstly, Oteh hit his second and the R's fourth from the penalty spot after being brought down in the box before Grego-Cox grabbed QPR's fifth after racing through the Town defence before calmly beating the keeper with a powerful effort in the 93rd minute. QPR U23s: Dieng, Paul, Hamalainen, Owens (Wallen 60), Caulker (Fox 70), Finney (Phillips 69), Grego-Cox, Eze (Rowe 60), Oteh, Chair, Prohouly. Goals: Prohouly 9, Eze 41, Oteh 44, 90+1, Grego-Cox 90+3. Picture courtesy of Stephen Lawrence.